This weekend I made a lot of good crafty progress! On Saturday, I had the pleasure of visiting with Jo. I always enjoy getting together with Jo and stitching with her. While there, I got a great deal done on my two Holiday Exchanges. Friday and Saturday nights I worked on Myster y9. I have one corner completely done including beads. Hopefully if this rain ever stops I can get a better pic of all the sparklies! Before going out to dinner tonight for a friend’s birthday, I spent some time in my craft room with the sewing machine. 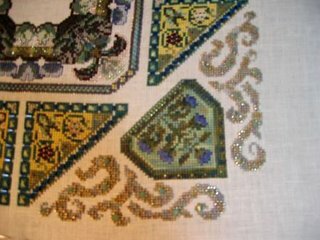 I wanted to do some machine piecing practice before I pull out the big quilt top kit that I have. 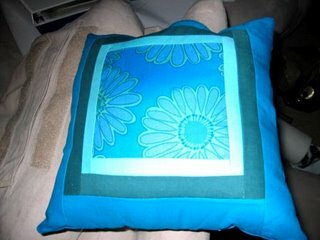 Today I made this cute little pillow. I think I am going to make little pillows for a few work friends that I exchange holiday gifts with. I am going to have fun picking out fabric for them. Wow, that pillow is really cute! I love the colours! Great progress on M9, too. Your sparkly corner is so pretty!!! You need to join Anne and I on Bordeaux Sampler! We are only on Part 2, not so very far along! Glad you had fun with Jo! Love your pillow Leslie, it’s really pretty! Your Mystery 9 looks good, nice pic of the sparklies. Nice pillow too. oohh, thats a very sparkly bit of stitching Leslie 🙂 Your pillow is lovely too. take care. Hello from France. Beautiful results. Best wishes for the next stitching step. Isn’t stitching together with a friend wonderful!! Great progress on M9 and what a pretty pillow. M9 looks great! I love the pillow-very pretty colors. They will make great gifts. Love that pillow you’ve just finished! I think your pillow makes a great gift idea! Wow, your Mystery 9 is stunning! I never realised it was such a sparkly piece. My admiration for you Mystery 9 girls increases every day! I love the pillow and what a great gift idea!! !